When I Went Scbua Diving in Maldives! I initially thought I would not go scuba diving at Maafushi, Maldives even though it is supposed to be a great spot for diving. I then thought I would just go and ask how much would it cost. I hoped it would be too expensive and I would walk away! No such luck, the first place I asked at was quite reasonable, they quoted me 80 US dollars for two dives. In the end I could not dive with them because they were full by the time we decided to register. When I told guys at my hotel about the rates, they said this particular diving center was new. Their tone sounded a bit cautionary. It didn’t work out anyway! I then went to Maldives Passions. They quoted 70 dollar per dive per person (without taxes) and even this was fine with me. Both my nephew and I decided to take a recreational dive, the hitch was my nephew doesn’t know how to swim. If you can’t swim you get to do only the bubble maker! We decided to go together so I also did the kiddie dive. I paid 100 US dollar as advance in the evening. We were to dive at 11.00 am the next day. I asked for a camera too, as this time I wanted some pictures of the event. I have to admit I was anxious even though this was the second time I would dive. I had done one dive in Havelock in 2011. I had not opted for underwater pictures then. All evening and part of the night I kept thinking why can’t I be content with snorkeling? It required no special skills and it was such fun. I was telling myself that in future I would restrict myself to snorkeling. My nephew on the other hand was cool, his motto- no point in taking any tension. Actually he was a good influence on me. The day of the diving arrived calm and fine. We went for a light breakfast. After that I stayed in my room till it was the time to dive. My heart was trying to come to my mouth forgetting that it has dived before. When it was time to clear out I was happy, finally I would be done with it. When we reached the shop, we were told that we would have to wait a bit as the dive master, Adham Rafeeu was, well out diving. I went and deposited myself into a hammock in front of the shop. The wait was not long. I thought I was wearing a wet suit but I was told that the water was pretty warm. They charge separately for the wet suit so I asked them if they would waive if off? They told me not to worry about all that, we would do costing after the dive. Then came the time to breath with the regulator. I so love breathing with my nose and I so hate it when I am not able to do so. As this was a bubble maker we were not going deep, even like 10-11 meters. I was actually relieved. So, initial instructions were less rigorous than my last time. When it came to breathing in water I was not feeling comfortable. When I said so the Adham, he quipped- “you are only breathing in, you are not breathing out!” There it was, as simple as that. Once I started breathing out inside the water, I was fine. In spite of having dived before I was so nervous I forgot to breathe out! Soon, it was time to go for the actual dive. I remember the weight belt from the previous dive. I put on the cylinder on the land at Maafushi, and how heavy it was, I almost staggered even though I had to take just a few steps to the sea. There were two of them for two of us. When I saw this I asked why could I not go deeper as I could swim, Adham told me that the other diver Rene was an apprentice! I told him, I was happy to follow the original plan. Rene was a young girl from Norway and I had a great dive with her. The underwater world was as fascinating as ever, full of fish and colors. The view from above never ever lets you see what a beauty it actually conceals! I was most fascinated by a set of corals whose tips seem to glow! I also strangely felt responsible for my nephew even though I could do nothing for him underwater. But he was always ahead of me, I could see he was doing fine. There was a short span of time when my head was getting crowded with negative ideas, like what if there was a ship above us, what if my air flow was interrupted! Thankfully these thoughts went away soon. I don’t think we stayed very long under water but then it is the best; to come out and start breathing through my nose again! Rene told me and Adham that I behaved well through the drive, I gave her no trouble at all! She said many times that I should consider doing a certification course! Now why do people put ideas in my head? My nephew told me later that at the start Adham took him out of water. He was asked to go slow and not run through. I somehow missed this entire phenomenon. In the end they did not charge me for the camera saying it malfunctioned underwater and there were just too few pictures. I was welcome to the pictures without any extra charge. Now that was mighty nice of them, I would have not known the difference. When I said so I was told true to their name diving was a passion with them and not just a source of money. Thank you Maldives Passions for the great time you gave us. Before I went scuba diving (I am one recreational dive old) I never associated sea with colors other than blue and its various shades. This was in spite of watching countless TV shows that displayed the beautiful underwater life. The beauty of the ocean registered firmly on me only when I saw it myself. Some people say I cannot stay away from adventure. But I have a slightly different take on it. I do not go out of my way seeking adventure, they just come my way! I have had my share of fun but scuba diving was different from everything else as in every other activity I was breathing through my nose and not through my mouth with a cylinder. It all started with an introductory video with Dive Andamans at Sea Shell Resort at Havelock. It did not look easy at all. The diving was to happen on the last day of our stay at Havelock. 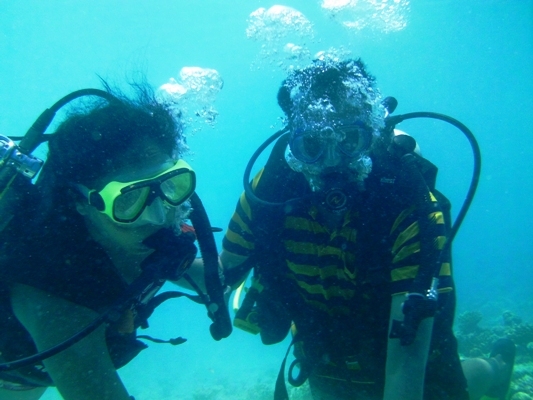 My friend and I decided to dive the next day itself and with the extended package called DSD or Discover Scuba Diving. We wanted to enjoy it at our pace and for whatever time we could. So with our hearts in our mouths we went to the beach on Friday (7 October 2011, 7.30 am)and waited for our instructors to arrive. They were Anne (from France but she knew Andamans for the last 4 years) and Rehan. Off we went with them to do the skills exercises and then to dive. On the way Anne told me it was her first dive too and other such slapstick stories. At one point she told me not to flap my hands while diving as she would be next to me and she doesn’t like getting slapped. I told her back that I would of course like to keep her in good humor as my life depended on it! The first thing they did is to hand us the wet suites. Getting into them was the easiest part. Then came the weight belt. It is a belt that has stones so that we would sink. Then came the buoyancy control device (a jacket) with the cylinder and everything else attached to it. You can see a great introduction to the scuba diving gear here. Then came the mask which covers your nose. I was OK with the mask this time because a few days back I had done snorkeling and knew how it feels when your nose is covered. Then came taking the air regulator in my mouth and learning how to breath with it first above the water and then under water! So far so good. Then came the skills part. You need to know a few hand signals to communicate with the instructor while diving, as obviously talking under water is not possible. Thumbs Up in scuba diving means ‘take me up, I am not comfortable’ and not the original thumbs up as we understand. Thumbs down means take me lower. The OK signal is making a round with thumbs and index finger and the other three fingers pointing up. You can see a lot of hand signals here, the second from the top is the OK signal. I think I used it the most. After that came the exercise which tells you what to do in case you let go of the regulator from your mouth. The obvious thing is to recover it, put it back in the mouth and start breathing again, while exhaling the breath underwater. I did not like the idea at all. While doing the exercise I stood up once and went over water as well. But in the end I learned how to recover the regulator even when it was not visible. Oh and I forgot the fins that you put on your feet as it helps to swim easily. Also I would need to equalize to release the pressure from my eardrums and this can be done by pinching the nose and blowing out gently. Then came the crunch time. We started walking underwater for our dive. As soon as I was really underwater I relaxed a bit knowing there was no escape now, I could not surface above the water without Anne’s help! Also I could breathe easily through the regulator and that too counted for something! I went with Anne and my friend with Rehan. And Rehan, the master diver is a 18-19 year old young lad! Before the dive I was telling my friend that I would not expect a National Geographic scenario but how wrong I was! It was as if I was in a national geographic movie! It is a different world out there! I saw the clown fish (made famous by the Movie Finding Nemo) and that was the only one I could identify. Then there were big fish and small fish, blue fish and yellow fish, colorful fish in general, sea horses and what not. Then there were corals and corals. Anne would point to something that would close into a ball on our approach. She pointed out to things that were half hidden. It was a riot of colors out there! Also she picked up a sea cucumber and let me touch it too! The day was clear and so was the water hence we had excellent visibility. At one point Anne came in front of me waved her hands and signed that I was on my own! I gave her a big OK sign but after a few second she held me again. She later told me that she could have left me but my gear and hence my weight was tilted to one side. I found it easy to equalize so I never had any pressure on my ears. But sometimes my head felt quite heavy. I almost wanted to show the thumbs up sign but then I persisted. I was not ready to get out of the wonderland! In the end Anne decided to come out. She was checking the pressure gauge and knew the depth and duration of the dive. I was not aware that we were on our way up. But then I saw an anchor of a boat in the water and I realized that we were heading up for sure. Then suddenly Anne’s head was no longer visible. I also surfaced after her. I have to say it was a relief to breathe through my nose once again. As soon as the group of four came together, the chatter started. I hugged Anne and Rehan, I felt so happy for the experience. My first question was how long did we stay under water because it felt like for ever. Anne told us we were there for 52 minutes and went down to 11 meters. Later I said that the pros must be finding this excited blabber of the first timers rather boring but they replied that they actually liked that, as it told them that people were happy! I was wondering that there must be really only a few jobs in this world where you get the money as well as a hug too at the end of the job! And while diving I never let go of the regulator even once. I hung on it with all my might as I had no intention of breathing out under the deep sea while trying to recover the regulator! By the next day my gums were sore from clamping on to the regulator. And that is all you need to do in the end if you are diving with an instructor, clamp down on your regulator and breathe! Later my friend said, “all night I was thinking what if we met a psycho diver who strangled us underwater!” I was glad for once that I do not have a vivid imagination and that she told this to me after the dive! How do you put in words the experience of my first scuba dive at Havelock? I don’t know how but I am still going to try. 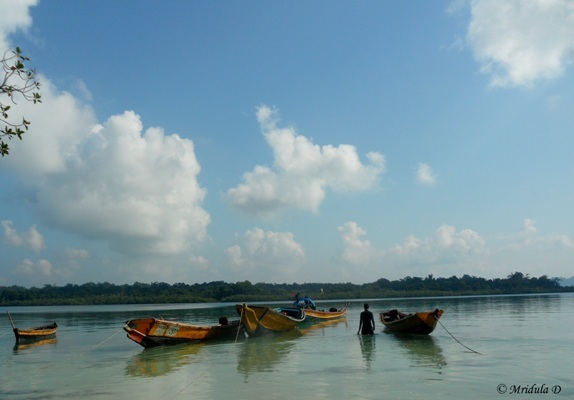 I spent a week in Port Blair and Havelock. I came back to reality just yesterday. I had more nights at Port Blair and less at Havelock but that is another story. This was my first package tour trip and I did it with Make My Trip. But then I am again going on a tangent. Everything else can wait. First I need to talk about my scuba dive. Fida of the Unusual Travel Destinations says I cannot stay away from adventure. But I have a slightly different take on it. I do not go out of my way seeking adventure, they just come my way! I have had my share of fun with Hot Air Balloon Ride, Rafting and Cliff Jumping, Para-sailing and trekking. But scuba diving was different from everything else as in every other activity I was breathing through my nose and not through my mouth with a cylinder. So with our hearts in our mouths we went to the beach on Friday (7 October 2011, 7.30 am)and waited for our instructors to arrive. 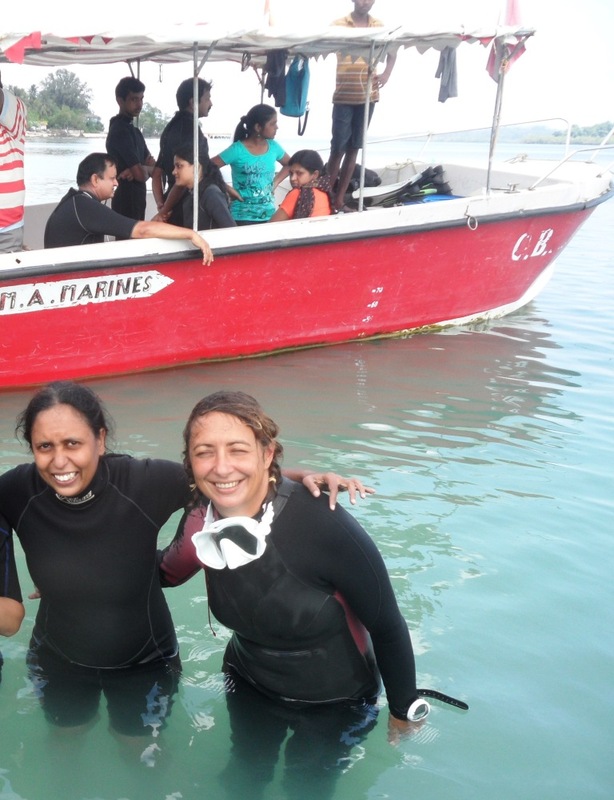 They were Anne (from France but she has been diving in Andamans for the last 4 years) and Rehan. So off we walked with them to do the skills exercises and then to dive. On the way Anne told me it was her first dive too and other such slapstick stories. At one point she told me not to flap my hands while diving as she would be next to me and she doesn’t like getting slapped. I told her back that I would of course like to keep her in good humor as my life depended on it! The first thing they did is to hand us the wet suites. Getting into them was the easiest part. Then standing near a boat that had the equipment, we started donning them one by one with the help of our instructors. First came the weight belt. It is a belt that has stones so that we would sink. Then came the buoyancy control device (a jacket) with the cylinder and everything else attached to it. You can see a great introduction to the scuba diving gear here. Then came the mask which covers your nose. I was OK with the mask this time because a few days back I had done snorkeling and knew how it feels when your nose is covered. Then came taking the air regulator in my mouth and learning how to breath with it first above the water and then under water! So far so good. Then came the skills part. You need to know a few hand signals to communicate with the instructor while diving, as obviously talking under water is not possible. 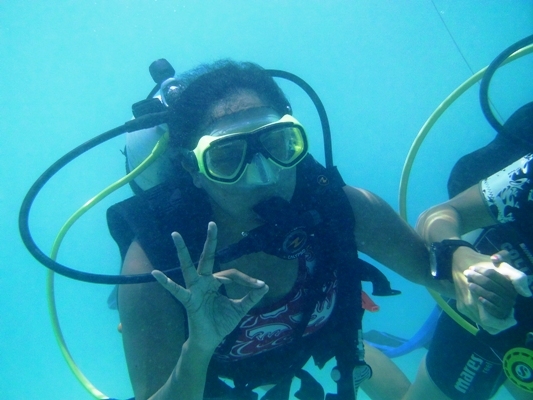 Thumbs Up in scuba diving means ‘take me up, I am not comfortable’ and not the original thumbs up as we understand. Thumbs down means take me lower. The OK signal is making a round with thumbs and index finger and the other three fingers pointing up. Actually you can see a lot of hand signals here, the second from the top is the OK signal. I think I used it the most. Before the dive I was telling my friend that I would not expect a National Geographic scenario but how wrong I was! It was as if I was in a national geographic movie! It is a different world out there! Before coming to Havelock I visited the Naval Museum at Port Blair. At that point I never thought I would be able to see a lot of the fish from the aquarium under the sea! 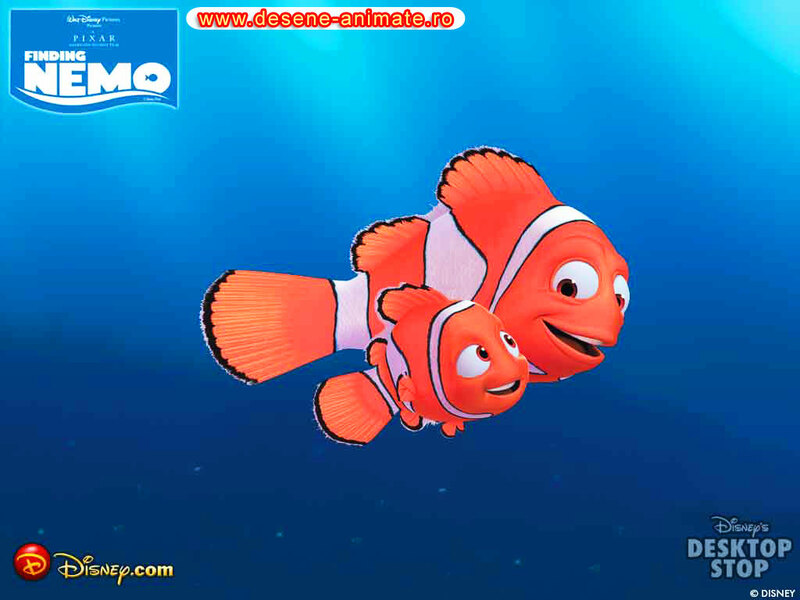 I saw the clown fish (made famous by the Movie Finding Nemo) and that was the only one I could identify. Then there were big fish and small fish, blue fish and yellow fish, colorful fish in general, sea horses and what not. Then there were corals and corals. Anne would point to something that would close into a ball on our approach. She pointed out to things that were half hidden. It was a riot of colors out there! Also she picked up a sea cucumber and let me touch it too! The day was clear and so was the water hence we had excellent visibility. At one point Anne came in front of me waved her hands and signed that I was on my own! I gave her a big OK sign but after a few second she held me again. She told me later that she could have left me but my gear and hence my weight was tilted to one side. In the end Anne decided to come out. She was checking the pressure gauge and knew the depth and duration of the dive. I was not aware that we were on our way up. But then I saw an anchor of a boat in the water and I realized that we were heading up for sure. Then suddenly Anne’s head was no longer visible so I too raised my head and surfaced. I have to say it was a relief to breathe through my nose once again. As soon as the group of four came together, the chatter started. I hugged Anne and Rehan, I felt so happy for the experience. My first question was how long did we stay under water because it felt like for ever. Anne told us we dove for 52 minutes and went down to 11 meters.